We are excited to see everyone at RootsTech 2017 in Salt Lake City, February 8-11! Our newest company, genealogyDOTcoach will make its debut appearance with a booth in the Expo Hall, Booth 113. 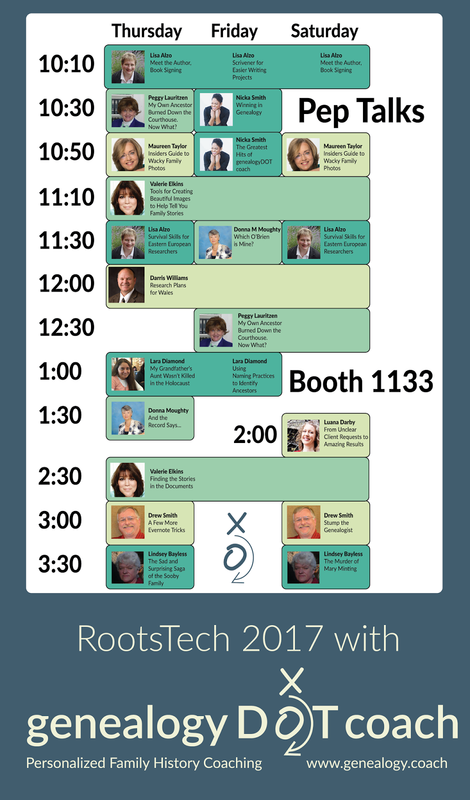 The genealogyDOTcoach booth is holding 31 free demo lectures (we're calling them "Pep Talks"!) throughout every day of RootsTech. See below for the Pep Talk speaking schedule for 12 of 26 coaches from genealogyDOTcoach. Stop by, say hi, listen to some free tips, and meet a coach!